As a naturally creative type of sentient being, we humans seem to thrive on hope and imagination. What if? What if I wrote a novel about ______? What if I began my next sculpture in just this way____? We reach out and extend ourselves into wondrous possibilities. I don’t know if this would be considered blasphemy among creative types or not, but after a lifetime in the arts, both as a writer and sculptor, I am compelled to say that hopefulness and imagination are useful to some degree. And then they are not. What is it about these two thorny words, “hope” and “imagination”, so alluring for their blossoms, but oh so difficult to handle without getting hurt? For some reason I think of that quintessential old Hollywood image of the tango dancer with a rose between her teeth. Oh so thrilling in the moment, in part because of the delicately delicious moment and in part, because of the understanding that the dance will end, and no doubt end differently than planned. The usefulness, or to use a less pragmatic term, the lovely thrills of hope and imagination are that they set us in motion, and they set us off with a question, What if? However, the benefits are brief. I’ve heard it said about tango dancing that it is an absolutely perfect two-and-a-half-minute love affair. So too with Hope and Imagination. They provide that oh-so-vital spark, but then it’s time to get down….and just do it. To engage in the business of craft. In other words, the question “What if?” needs to transform into the question “What is this?” From then on, we are immersed in the doing, making, being of our artistry. As we write, sculpt, live, all that transpires feeds into the creative work. If we spin out (so to speak) into too many “What ifs?” we will never “do” anything at all. And therein lies the essential risk. To access hope and imagination is wonderful, but it is also wonderful when we know how to let them go, thank them for the dance and then go ahead and make the most glorious work of our lives. 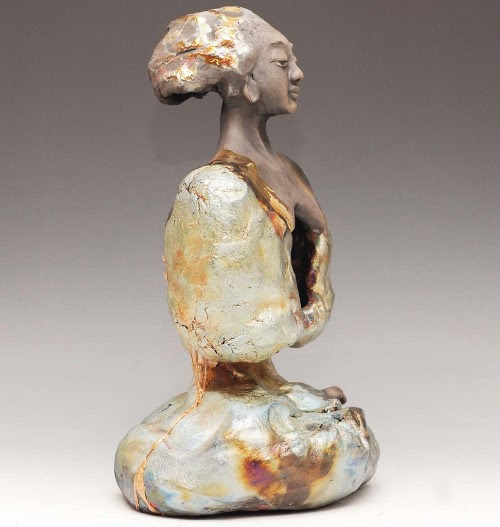 Kwan Yin, in honor of our mothers, or whoever mothered us…..
As Mother’s Day approaches, I think of all that care, and patience, and even impatience — all born out of love. 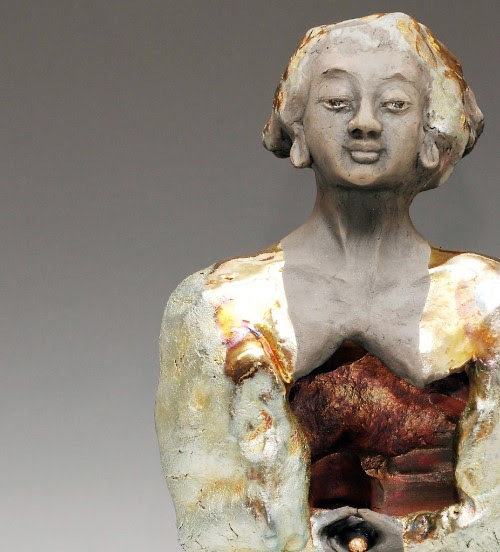 Mothers and children, we come as we are, as these sculptures reflect — brimming with brilliant colors, a bit cracked at times, with that gesture of concern and care. Is this a Buddha or a Kwan Yin? Always, (or almost always) we see figures of Buddha sitting in calm repose. Can one sit in calm equanimity in the midst of despair and grief? Both within and without. I’ve always been intrigued by the classifications of artists as being in one of three realms: beginning, emerging and established. May we all aspire to the first two and remain highly suspicious of the last! Here is a new piece, more abstract and at the same time, I would suggest, more real.